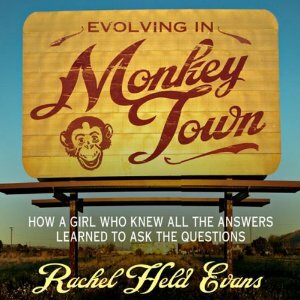 Rachel Held Evans first book. She’s young, church-going…. and not very sure about her faith. Does she represent the future of “evangelical Christianity”? How do you handle doubt? Some want to shove it under the rug. Some, frankly, never really go through serious periods of doubt. Others wallow in their confusion. Some simply rebel as an escape mechanism. Others are driven to God’s Word, study, prayer, and fellowship to find answers. Where do you go when you begin to second guess everything, if you ever do? Part of what we are trying to do with Veracity is to provide tools to help folks to get into God’s Word so that God’s Word can get into us. What resources are available that can equip us to better understand our faith so that we can better serve the Lord in our worship and witness? However, there are times where doubt can plague us in our spiritual journey and threaten to derail us spiritually. Perhaps an explanation about the Bible we once heard no longer makes sense anymore. Or is there some assumption that we have made about the Christian life that no longer appears to be working? Perhaps we expected God to do something and things did not turn out the way we think it should. Doubt is an enormous topic to tackle in a single blog posting. So I will be content for now to give you a partial case study. Rachel Held Evans. Blogger. Author. Controversialist. Rachel grew up in the Buckle of the Bible Belt, spending the bulk of her teenage years in Dayton, Tennessee. Dayton is the town where the infamous Scope Monkey Trail took place in 1925, a watershed moment for evangelical Christianity in the United States. Rachel was raised in a very conservative Christian background, eventually attending evangelical Bryan College there in Dayton where her dad was working as a college administrator. In her teens, she was an avid Young Earth Creationist who wrote, “Lies, Lies, Lies,” in her high school biology textbook wherever the topic of evolution was discussed. However, something happened to her in college. As she discusses in the following video, she began to have doubts regarding the exclusiveness of the Christian message with respect to religious pluralism. As that college student, she witnessed a television report of an Islamic woman in Afghanistan accused under the Taliban regime of murdering her abusive husband. The woman was beaten, taken out to the middle of a soccer stadium, and then brutally shot. Rachel eventually survived her period of extreme doubt, though she still struggles with it from time to time. Though she still considers herself an evangelical (though barely at times), she pushes the envelope, and many view her claim to orthodox belief as being suspect at best. Nevertheless, she still clings to her Christian fundamentalist heritage in some way, while being deeply troubled by what she sees as a naive narrow-mindedness in the church. She is living in a state of process, shall we say? Or perhaps a state of confusion? Typically, going through a period of serious doubt leads to some rather unsettled and unfinished conclusions along the way. For some, they fall off a cliff theologically. Rachel Held Evans is striking a nerve. TIME magazine recently rated Evans as having one of the “140 Best Twitter Feeds of 2014.” My blogging colleague, John Paine, reported once on an article written by the late Michael Spencer, a.k.a. the InternetMonk, on the “Coming Evangelical Collapse”. Ms. Evans represents that younger generation of folks in our churches that want to call a cease-fire in the culture wars, but it is an uneasy détente. Unless there is a serious attempt of what John calls “personal discipleship” to address the questions of Rachel Held Evans with real, substantial Biblically-based intellectual tools that will help people through seasons of doubt towards a renewal of faith, the church will risk further alienating a rising generation that continues to hold the message of the church at arm’s length, even among folks who currently consider the evangelical church as their home. So what does this case study concerning Rachel Held Evans have to tell us about doubt? For one, doubt does not hit everyone the same way. For Rachel, it hit her and continues from time to time to hit her hard. I must confess, I am no stranger to her journey of doubt. Thankfully, doubt is not unknown in Scripture. Scholars have debated Jesus’ own words for centuries where He hung on the cross and shouted out, My God, my God, why have you forsaken me? Some people never go through seasons of doubt, but going through periods of deep personal questioning is altogether not that unusual. The issue is where do we go when we experience these doubts? For Jesus, He continued on in obedience to the divine will to the point of death on that cross, to bring about the salvation from our sins. Onlookers were puzzled. After all, was not this the Messiah who came to deliver Israel? Why is He being crucified? But Jesus stuck to the truth in radical obedience, and we who are recipients of His grace and mercy eternally benefit. I find that obedience in the face of doubt is not easy. But running away from God in the midst of doubt does not seem to get me very far either. Drowning out my doubts with destructive behaviors, or even well-intentioned positive activities, may provide temporary relief but they only delay the inevitable. And then there is the “paralysis of analysis”, always nurturing doubts to the point that they begin to take over everything. Self-absorption can be contagious, and for someone like me who is a second-guesser, this can be a tough one to resist. Sometimes, all it takes is a minor off-hand comment from some well-intentioned churchgoer that drives me ABSOLUTELY bananas. In Rachel Held Evans’ case, it could be that growing up in a rigid fundamentalist background was enough to make it an unsafe environment to ask questions. Only later does the suppression of those questions eventually cause the top of the lid to finally blow off. We end up over-reacting, tragically causing an even more destructive mess and wounding others in the process. I do not carry the same baggage that Rachel Held Evans has, so I do not know everything of her journey. But what I do know is that there is a danger of simply burying myself in my doubts instead of going to God even with my doubts in prayer. As Psalm 23:4 says, “Yea, though I walk through the valley of the shadow of death, I will fear no evil: for thou art with me.” Are we willing to let go of those barriers and trust God even with our doubts? There is more to the Rachel Held Evans’ story. It concerns an issue that particularly shakes up at least a good half of the church. More on that in a future post. In the meantime, consider this: you may think that Rachel Held Evans has fallen off that theological cliff, or maybe not. But where do you go or where do your friends in your Christian fellowship go when you or they struggle with doubt? Zondervan has re-released Rachel’s first book in April, 2014 with a brand new cover and a new title, Faith Unraveled: How a Girl Who Knew All the Answers Learned to Ask Questions. Though I have not read the book, and the new re-branding of the book looks a bit too “girlie” for me, the questions she raises are the kind of issues that deserve thoughtful answers in an era when the rhetoric is charged on many sides and a respectful dialogue is sadly in short supply. This entry was posted on Friday, May 16th, 2014 at 8:16 pm	and tagged with doubt, Evolution, inerrancy, rachel held evans, Religious Pluralism, Young-Earth Creationism and posted in Witnesses. You can follow any responses to this entry through the RSS 2.0 feed.